Harlan County KY – Let's Go RVing! Wow, we must have been really tired last night because both of us slept like logs and woke up feeling refreshed. We slowly drank our coffee and enjoyed our quiet morning and then decided we needed to get busy as we had several things we wanted to do today. The first stop was the June Toliver House which opened at 10:00 – except it didn’t so we went to the Harry Meador Coal Museum. The guide, Fred was extremely knowledgeable and had worked in the mines for 40 years so as well as just knowing a vast amount of information about mining he also added personal experiences. Listening to him talk really makes one appreciate the difficulties associated with the life of a miner. To say it was not an easy life is quite an understatement. Afterward we went by CVS and then the grocery store, then back to the coach for some lunch, a grilled cheese sandwich and hot tomato soup. It was a nice meal for such a cool rainy day. 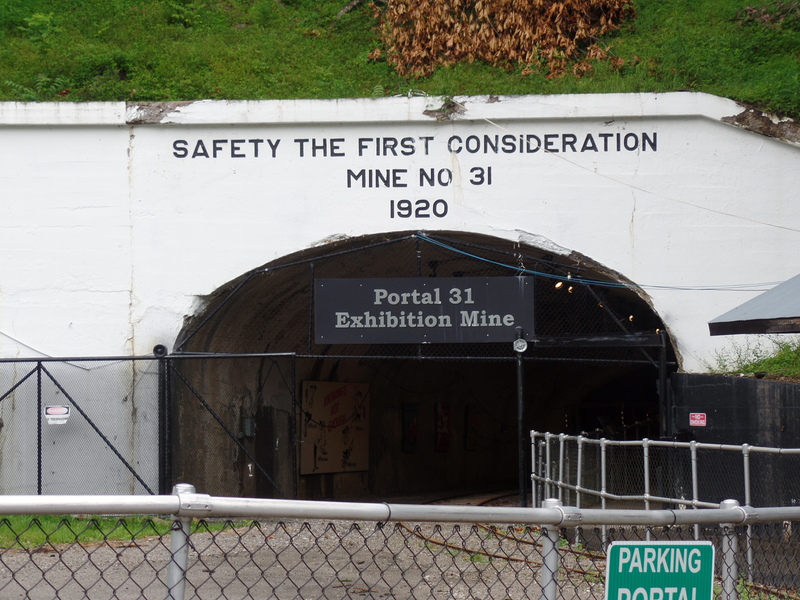 Then we headed to Lynch to visit the coal mine, Portal 31. We left Big Stone Gap, went to Appalachia then headed up the mountain to Lynch which by the way is in Kentucky. Who knew? No wonder we couldn’t find any information on it when we googled Lynch Coal Mine in Virginia! The road up is so very curvy, by far the most mountainous road I have been on in many years. At times I had to just close my eyes. The rain and fog didn’t help at all and neither did the idiot tailgating us who then passed us on a double yellow line. Hope he didn’t fly off the side of the mountain – it wouldn’t have been difficult. We reached the top, drove into Kentucky and arrived at Black Mountain, the highest mountain in Kentucky. Then we started the descent into Lynch. Wow. Jerry did a terrific job navigating the treacherous road, at times one lane. I couldn’t believe the big trucks. Glad I was not driving one. As we entered Lynch we noticed all of the houses very close together and very similar. You could tell at once that they were miner’s houses, little to no front or back yards. We stopped at Portal 31 and were directed to the next town where the museum was located. There we could visit the museum and buy tickets for the 3:00 tour. We spent about 30 minutes at the museum. They had a large area devoted to Loretta Lynn so I thought Butcher Hollow where she was born might be nearby. No, Butcher Hollow is about 2 hours from there although she had thought of putting her museum there, thus all the memorabilia. One of the most poignant moments was when I read a letter written by a man to his wife and children after he had been in a mine cave in. He knew he was going to die so he wrote literally his last words. There were three messages from men but only one of them showed the copied letter. It was heartbreaking. We went back to Portal 31 and began the tour. The young man who was our guide had worked in the mines for 10 years until he got laid off. 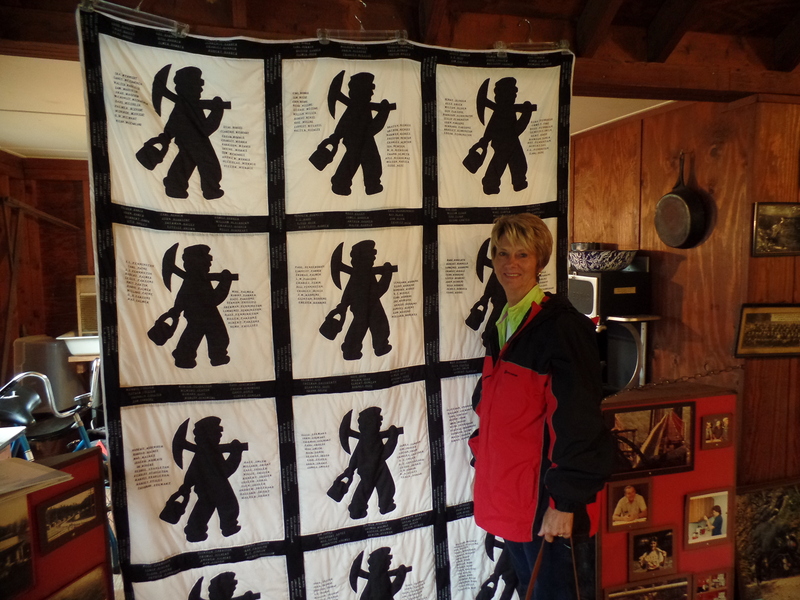 Several years ago there were over 250 mines in Harlan County and now there are only 6. Mining is the only employer in the county so you can imagine the economic state of the county now. This young man is going back to school and then will leave the area. His story was so sad and apparently typical of many young people in the county. He gave an excellent tour lasting over an hour. In fact we were in the mine so long that someone came looking for us to make sure everything was OK. When the tour started and we went through the opening I had a moment when I wondered what in the world was I doing going 2000 feet below. I just took a deep breath and tried not to panic. That’s not to say I didn’t immediately grab Jerry’s arm! The mine was dark and cool but the air was clean. I could just imagine though the miners who many years ago suffered with Black Lung. What a way to make a living. Oh, Jerry got a small piece of coal and a piece of slate. We came back to the campground through rain and fog. I had wanted a picture of us at the sign at Black Mountain and the sign saying Welcome to Kentucky. It was raining so hard that I just got out and took a picture of the Black Mountain sign. I tried to get a picture of the Welcome sign but the fog was so dense that it didn’t show up on the camera. Darn. We made it back to Big Stone Gap and made another try at the June Tollier museum. It was an interesting visit. I really want to watch the movie and read the book. Came back to the campground and Jerry took the sheets over to do the washing and I stayed in the rig and cleaned and straightened up. Later went over and paid for our visit – $30 a night plus tax – visited with a few people and then helped Jerry put the car on the car dolly so all he’ll have to do in the morning is disconnect the electricity, water, etc. and flush the tanks. That’s a good thing because it has begun to rain even harder. Sounds nice on the roof but I hate for Jerry to have to deal with mountain roads and rain. Good night – it’s 10:00.